Whether it’s your head, tooth or back, when you’re in pain, it’s hard to think about anything else. If it’s not too strong, some can ride it out. But in many cases, the pain just gets worse and won’t go away until you take something. Medicines that kill pain are called analgesics and they vary in how they work. No single painkiller can relieve all types of pain. Those that work for mild pain usually have little effect on severe pain unless combined with a stronger painkiller. If you want to effectively control your pain, you will need to match your medication to its type and severity. Nociceptive pain is caused by damage to body tissue. If the pain is mild, such as a headache or a sprained ankle, commonly used over-the-counter painkillers are effective. These include tablets containing paracetamol (Panadol), aspirin, or non steroidal anti-inflammatory drugs (NSAIDs) such as ibuprofen (Nurofen). 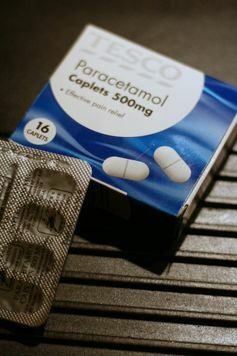 Paracetamol helps to dampen pain signals to the brain. NSAIDs inhibit the activity of the enzymes that lead to pain, inflammation and fever being produced in the body. Combination tablets, which have a small dose of codeine plus paracetamol, aspirin or ibuprofen, can be used to treat moderate pain. In Australia, you can buy these kinds of painkillers only in a pharmacy. Those sold over the counter have brand names such as Panadeine, Aspalgin and Nurofen Plus. The government recently announced it will make any medication containing codeine available only with a prescription from mid-2016. It is important to remember the maximum adult dosage for paracetamol is four grams (eight tablets) per day. Taking more than the recommended dose can cause damage to your liver. Painkillers typically prescribed by a doctor to relieve acute to moderate pain are codeine together with paracetamol tablets (Panadeine Forte) and tramadol tablets, which are opioid pain killers. The severe pain you experience following a broken bone or an operation usually needs strong painkillers that your doctor would prescribe. This may be morphine given as a tablet or by injection. 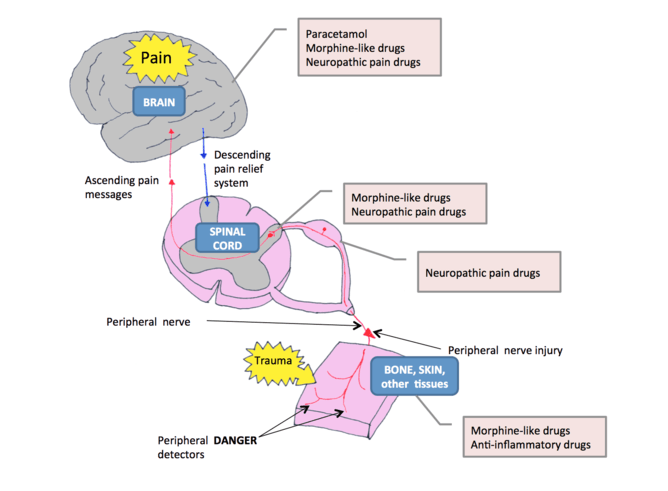 Morphine-like medicines relieve pain by interacting with specific proteins called opioid receptors, which are located in the brain, spinal cord and other parts of the body. These opioid receptors are the same ones the body’s own natural pain-killer molecules, called endorphins, use. Neuropathic pain is pain caused by damage to the nerves. Painkillers such as morphine, NSAIDs and paracetamol that are effective for the relief of nociceptive and inflammatory pain conditions are not effective for the relief of neuropathic pain. This is because the underlying mechanisms that cause neuropathic pain following nerve injury are different from those that induce nociceptive and acute inflammatory pain. Medications originally developed to treat depression and epilepsy are recommended as first-line treatments for the relief of neuropathic pain. Antidepressants alleviate neuropathic pain by boosting the body’s own pain-fighting pathways. This includes boosting signalling in the brain which inhibits pain-signalling at the level of the spinal cord. The detailed mechanisms by which anti-epileptic drugs alleviate neuropathic pain are diverse but the net effect is to dampen pain signals. Migraine is a particularly debilitating type of pain. It is often accompanied by nausea, vomiting and sensitivity to light and sound. It can last for a few hours or several days. Migraine affects about 12% of Australians. Some experience auras such as flashing lights or changes in smell perception, which can serve as early warning signs the migraine is coming. If painkillers such as paracetamol, aspirin, ibuprofen or ergotamine (made specifically to relieve migraine by narrowing blood vessels in the brain) are taken at the onset of the aura, the migraine can often be stopped or its severity reduced. For those suffering a severe migraine attack, prescription medications known as triptans can be effective treatments by reversing the brain blood vessel dilation. Chronic pain affects up to one in five adults. One of the most common is pain from osteoarthritis, the most common type of arthritis. Osteoarthritis pain is a chronic inflammatory pain caused by arthritic joint disease, typically in the knee or hip. As the joint cartilage and underlying bone break down, the joint becomes inflamed and this triggers the pain. The first-line painkiller for osteoarthritis pain is paracetamol. For people with more severe pain, NSAIDs such as naproxen may be more effective. But chronic use of these is associated with an increased risk of side effects, especially bleeding and ulceration of the stomach lining. Less commonly, morphine or strong morphine-like analgesics are prescribed. Most cancer pain is caused by the tumour pressing on bones, nerves or other organs in your body. Pain can also be caused by the cancer treatment such as chemotherapy or radiotherapy. Oral morphine-like analgesics taken regularly, often in combination with paracetamol, are prescribed for moderate to severe chronic cancer pain. Although drowsiness usually occurs at the start of treatment or after a dosage increase, this typically reduces after a couple of weeks. Anti-nausea and laxative agents are given at the beginning of treatment to minimise the side effects of nausea, vomiting and constipation. Nausea usually lasts no more than two to three weeks. However, as constipation persists, it is very important that laxative use is maintained. For cancer pain involving nerve impingement, your doctor will add a prescription painkiller for neuropathic pain. This article is part of a series focusing on Pain. Read other articles in the series here.